Dara Hourdajian found lighting, HVAC, data center and equipment upgrades that could help adidas Group meet many of their sustainability targets. Dara Hourdajian spent her summer in Portland, Oregon and Carlsbad, California evaluating energy efficiency projects for the adidas Group, a global sports and manufacturing company. The company is committed to robust sustainability targets and Hourdajian found significant lighting, HVAC, data center and equipment upgrades that would help the adidas Group meet many of its goals. Working with the Energy Trust of Oregon and San Diego Gas & Electric, Hourdajian identified resources, rebates and funding to support the transition to more energy efficient facilities. By analyzing the building’s energy usage and potential savings from proposed projects, Hourdajian calculated that adidas could reduce consumption by 25 percent in the Portland office and 20 percent in Carlsbad. 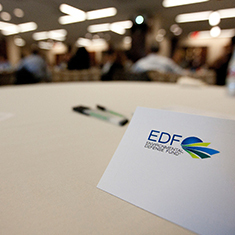 Dara Hourdajian, a student at Columbia University, was hired as a 2011 EDF Climate Corps fellow at adidas.